The page introduces basic ideas how to become a more efficient server. The purpose of the volleyball serve is to distract the opponent's offense. The server's goal is to make a tactical serve which increases chances for your defense to stop the opponent's offense . A player distracts the offense by serving the ball over the net to specific location on the court using underhand serve, top-spin serve, float serve, jump float or jump serve. It is usually not the main goal because it may lead to many serving error's, but the server could also try to make an "ace" - to make a straight point with the serve. Underhand servers should release the ball into the air before hitting the ball; it is illegal to hit the ball without releasing it from the holding hand first. A player has to perform the serve behind the backline. This means a player can not step on the line. When a player serves, the feet must have last touched the ground inside the sidelines, and not on the endline. A player can't step on the backline when serving, but can step on the backline after the serve. The location of the ball on the serving moment does not matter, so hypothetically a player can hit the ball outside the sidelines. Since the volleyball serving rule changed, let serve (ball hitting the tape, the top of the net and landing to the opponent's side inside the lines) has been legal. Importance of a serve has grown since volleyball started to use a rally scoring. Games are much tighter nowadays, teams are often separated by just couple of points. Now your serve really matters because that's a major weapon to give your opponent hard time and prevent them scoring a point on their offense. 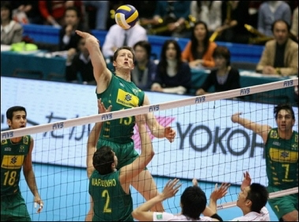 Especially in the international high level volleyball serving with risk has led to growing number of errors in a game. There you have to take risk and serve hard, otherwise your opponent will score a point against you. "When playing against the best team in the world, you might have a chance to score some points, if you serve very aggressive and let yourself miss some serves." He continued: "However, if you play against an easier team, there is no reason for the aggressive serves and mistakes. You will score points with a moderate serve; there is no need to be extra aggressive." Volleyball Serving - Where to Place the Serve? When serving in the match you should first evaluate what serving strategy gives the best chances to score points and win the game - then proceed with it. Today, especially with the beginning players, the coach may guide the server to place the serve. In many teams the coach shows a finger sign where to serve the ball. Some coaches are opposing this strategy and do not like to show the signs because they want the player to think and make a decision by themselves. However, it's a very common way since usually the coaches notice what is the best chance for you team to score a point in each rotation. The purpose of the volleyball serve is to give hard time to the opposite team's offense. Remember what serving strategy will give the best chances to score points and win the game. When the opponent's offense is strong, it is reasonable to take more risk with serves. It is a fact that a more difficult serve will most likely increase the amount of serving errors. Those errors just need to be accepted. More difficult serves will most likely increase the number of inaccurate passes. When you break down opponent's serve receive, you'll make a big damage on their offense. Serving is all about the toss. An accurate and predicted toss reduces the misshits. Keep your eyes on the ball at the moment you hit it. When practicing the specific serve, keep the toss and your arm swing the same every time. Just focus on repeating the same exact serve, one after another. A detailed repetition helps to become more accurate in that particular serve. Your serving repertoire should always be the same. Then in the match, you just repeat the same exact steps as you have practiced. A repetition helps you to put the serve into your unconscious mind. When you are able to see yourself doing the perfect serve on your mind, you'll become a much more accurate and powerful server. Learn more than one serving style to give hard time for passers. Learn serving tactics. Learn how to serve to give the best opportunity for your team to score a point.